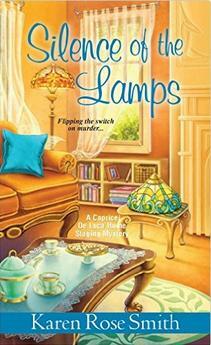 The amateur sleuth in this cute cozy mystery series is an Italian-American small business owner, Caprice de Luca. She stages homes for sale, so the book includes much about furniture and lifestyle, and even recipes and cooking, thanks to Caprice's sister Nicoletta's catering career (third sister, Bella, runs a sewing business). Click the cover to visit the book's Amazon.com page. Being a cute cozy, along with the light mystery story we get lots of sweet interaction by Caprice with charming and amusing family members, a best girl friend, a desirable chaste boyfriend, and various adorable cats and dogs. There is the requisite small town setting and conservative values, along with an odd dash of new-age thinking and mantras. The narrative style is the genre's usual 3rd person limited mixed with some 3rd person omniscient at times. The genre's elements are faithfully followed. The recipes are clearly made for U.S. American readers, not terribly original, and not all Italian inspired. Book Three in the series. This cute cozy mystery novel is clean and simple, making it suitable for tweens, teens and adults. The cute pastel covers of the series' books are cartoonish, showing that the stress is on sweet entertainment rather then the crimes that set Caprice investigating. Business has never been better for home stager Caprice De Luca, but her personal life could stand a few renovations. Just when she thought things were getting serious with her boyfriend Grant, his pretty ex-wife swoops into town and nabs his attention. Uncle Dom is living with her parents and desperately needs a new job. And her sister Nikki's catering business is threatened when rival Drew Pierson starts eating away at her share of the market. Things could not possibly get more chaotic when Drew is found bludgeoned to death by one of his grandmother's antique Tiffany lamps--and Nikki is the number one suspect.